You’ve definitely heard at one point or another someone tell you that all the music on the radio is the same. Well what if that was at least somewhat true? 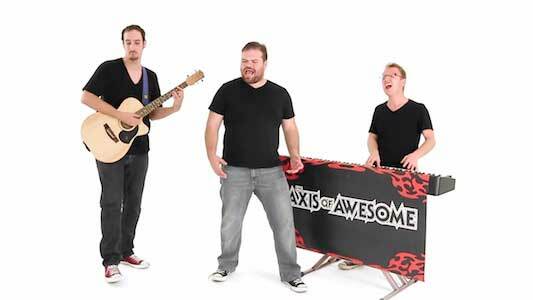 The Australian musical comedy group Axis of Awesome set out to prove that very notion with their song “4 Chords”, a compilation of 47 well known pop songs that all follow the I-V-vi-IV chord progression. It went viral back in 2011 when it was released, and while it is funny to see how true that old adage about pop music is somewhat true, the song itself is also catchy on it’s own and a work of expert artistry. All three members wearing different colored chucks. The song begins with Journey’s “Don’t Stop Believing”, which sets the tone for the rest of medley by introducing not only the progression, but also the key of D, which is not the normal key for many of the songs. The three members of the band, Benny, Jordan, and Lee, all sing different sections, and sometimes harmonize with each other as well. The medley is composed of some of the best known pop songs of the last 50 years including “You’re Beautiful”, “Take Me Home, Country Roads”, “Let It Be”, “No Woman No Cry”, “Take On Me”, “When I Come Around”, “It’s My Life”, “Auld Lang Syne”, and many more. There is somewhat of a subtle story told throughout the medley, and it ends on the phrase “that’s all it takes to be a star”, showing that all it takes to make it in pop music is 4 simple chords. Jordan riding a skateboard hoping to stay “Forever Young”. 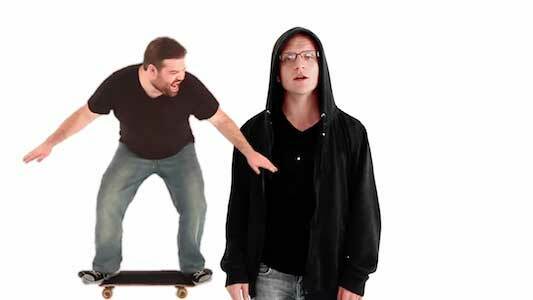 The music video features Benny introducing “Don’t Stop Believing”, and then telling Jordan and Lee that that same chord progression is used in a few other songs as well. The video then follows the band covering each different song, all while standing on a white sound stage. The band continuously change costumes as they go through each song, which offers up some hilarious visuals and helps visualize the subtle story through the whole medley. Each member is wearing a pair of chucks with Benny wearing a faded black pair, Jordan a new black pair, and Lee sporting some red ones. 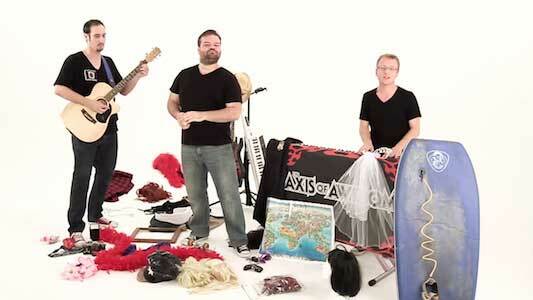 Overall, it’s a great piece of work that’s musically brilliant, coupled with a funny video.